Automation now touches every phase of our lives with systems serving in areas never before considered. As new technology develops, your benefit is in a professional company that remains current with the developing trends. For over a dozen years, Security Safe has been installing home automation and remote control systems. Do not be misled by the recent boom in smart-home tech items that have been thrust into the spotlight through massive advertising. Why have multiple products that work with multiple systems? Security Safe is your qualified professional in knowing, designing and installing systems that work in unison. We can provide you with state-of-the-art technology Powered by Alarm.com. Home automation is exactly what the name implies: automating the ability to control items around the house—from window shades to pet feeders—with a simple push of a button (or a voice command). But the possibilities are almost endless and are custom designed to your home and lifestyle needs. Don’t want the sun fading your favorite couch? Program the drapes to close at the right time daily. Out of town on vacation and want to conserve energy by turning the hot water heater off? Use automation to reactivate it at a planned time before you get home. Concerned about the massive damage cause by water leaks? Set up your automation to turn off the home water supply when moisture is detected in certain areas. Got a fortune in food in the freezer? Use automation to notify you of abnormal temperature ranges inside the freezer. 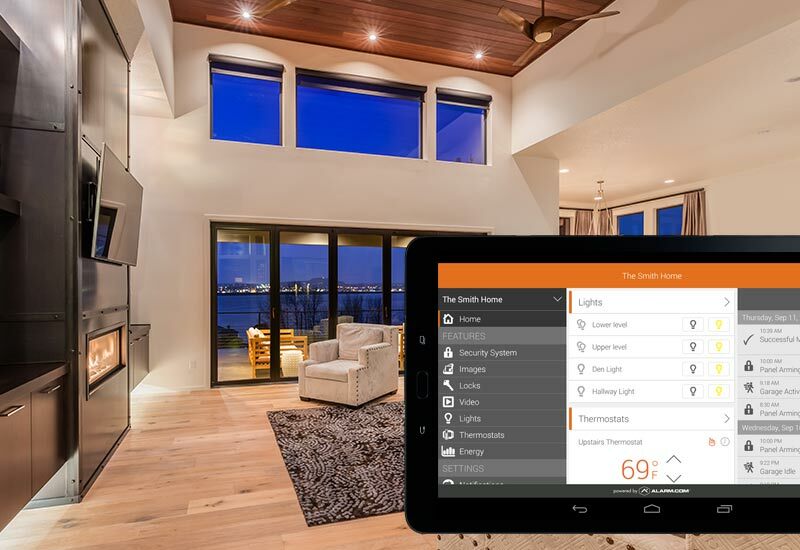 Control your home and the functions of your systems from the remote simplicity of your smartphone, wherever you may be. Let your imagination wonder, then let Security Safe assist you in putting it into reality. Oh, and don’t worry – we can handle your imagination, no matter how ‘outer space’ it may seem. Call a Security Safe automation design professional today.